Since we would have been transferring at the Notre Dame metro stop anyway, we decided to get out and check it out — how couldn’t we, really? The outside looked just as I’d expected it to, though its clean, light stone makes it look like a much newer building than it is. The stone carvings are wonderfully intricate, but since they’re all in one color, very symmetrical and very formal, Notre Dame looks quite restrained compared to a lot of other Cathedrals I’ve been to. 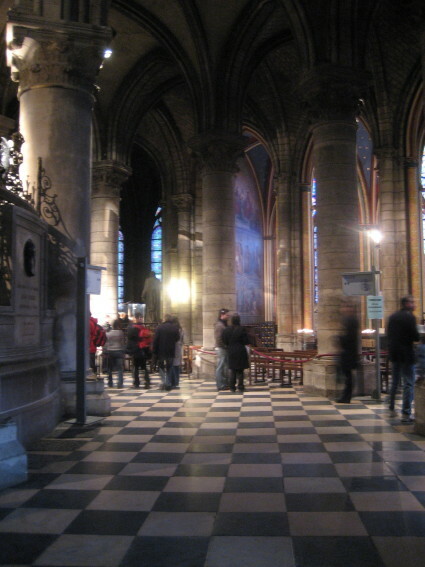 Once inside, the place is light and airy, with extremely high vaulted ceilings, some very impressive stained glass and towering stone support columns. I was surprised by how comfortable I felt there. I usually find Catholic churches quite scary — they can be so dark and have so many wounded and bleeding icons that I find it hard to relax and really enjoy what I’m seeing. Thankfully, there was no gore here, and a surprisingly lax policy about letting visitors wander about while a service was going on, which was a little odd, but nice that we weren’t shooed away. 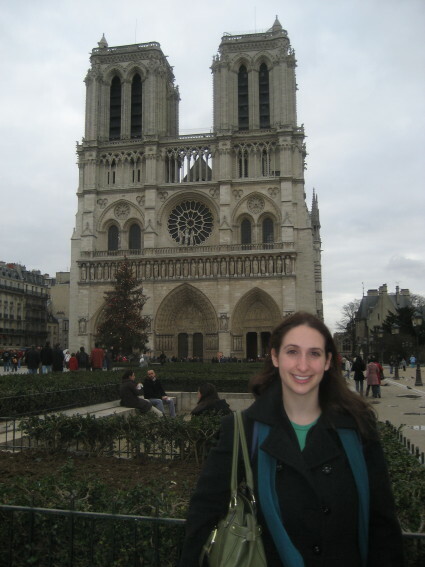 We wanted to climb the towers, but the line was very long, so we decided to move on, but not before walking around the whole building and getting a view of all the flying buttresses and rose windows.